Entertainer and Oahu native Bette Midler will pay a $6,500 fine for improperly cutting down more than 200 trees on one of her Kauai properties, an attorney representing her said yesterday. "It was cleared without permits, and without the realization that permits were necessary," Kauai attorney Max W.J. 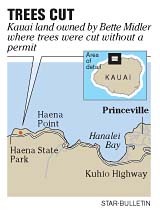 Graham said of Midler's 58,500-square-foot lot in the Haena District of Kauai's North Shore. State conservation workers noticed Oct. 17 that Midler's vacant lot makai of the Kuhio Highway from Limahuli Valley was being cleared and that a graded road had been built to it, says a report to the state Board of Land and Natural Resources. An after-the-fact survey by botanists hired by Midler determined that 120 Java plum trees, 100 octopus trees and 10 to 20 Madagascar olive trees -- all non-native species -- and an undetermined number of native hau trees were removed, the report said. Because the land is zoned for conservation uses, any activity on it must be approved by the Board of Land and Natural Resources. The cutting down of the non-native plants, the native plants and the road should be considered three separate violations, with fines of $2,000 each, plus a $500 administrative fee, the staff recommended. The Land Board will decide at its meeting Friday whether to follow staff recommendations. Graham said Midler will pay the fine and comply with the requirement that the land be restored. "The whole idea with cutting the trees down was with the idea of improving the lot with native species" instead of the non-native, invasive species that had grown there, Graham said. "It's unfortunate that a mistake was made." Biologists from the National Tropical Botanical Garden, which maintains three gardens on Kauai -- including the Limahuli Garden just mauka of Midler's Haena property -- will design a replanting plan that consists of appropriate native plants, Graham said. There is no house on Midler's Haena property nor plans to put one there, and Midler "doesn't own any property around it," Graham said. "I'm not even sure where she stays when she's on Kauai," he said. In 2000, Midler bought 1,400 acres of farm land mauka of Kapaa from Amfac/JMB Hawaii LLC for $4.5 million.